WESTS Tigers players would love to put a shot on their former pin-up James Tedesco - provided they can catch him. 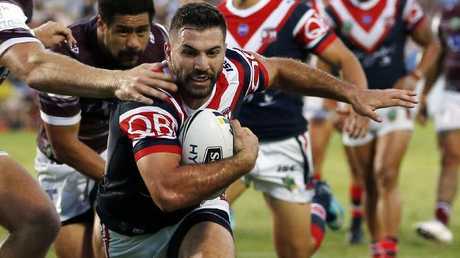 The clash between the Tigers and Tedesco's Sydney Roosters will be one of the highlights of the opening weekend. A day after Tedesco said he would not be surprised if his old teammates targeted him next Saturday at ANZ Stadium, a couple of Tigers said they would do their best to try and stop him in his tracks. VOTE: Who should be league's next Immortal? "But he's so elusive and strong for his size, which makes him handy and hard to put a shot on him,'' prop Sauaso Sue said on Tuesday. "I'll be happy if we can wrap him up. Winger Malakai Watene-Zelezniak struggled to list one of Tedesco's weaknesses the Tigers may hope to expose. "I don't think he has any (weaknesses),'' Watene-Zelezniak said. "He's pretty good. He's such a dangerous player, he plays adlib footy, and he's most dangerous when he's got the ball in his hands. He can create something out of nothing. Sue failed to feature in the club's two trials because of a hamstring twinge, but was hoping to force his way back into the front-row for the season opener. Elijah Taylor and Matt Eisenhuth had spent time in lock where Sue spent a fair chunk of time last season. Watene-Zelezniak looks to have retained his spot on the left wing and was keen to get one over his Roosters opposite Blake Ferguson. Bookies give the Tigers little hope in round one - or the remainder of the season - and while the players know they will get a good guide of where they are at against a "benchmark'' team like the Roosters, they were happy with their own squad and structures. 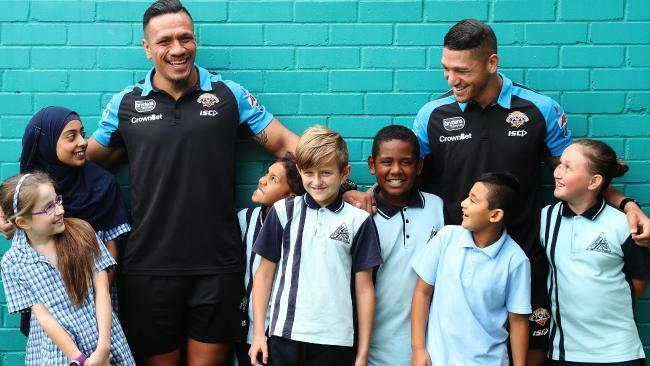 The Tigers visited more than 80 schools, including Tedesco's former primary school, as part of a community blitz across Sydney's southwest on Tuesday.